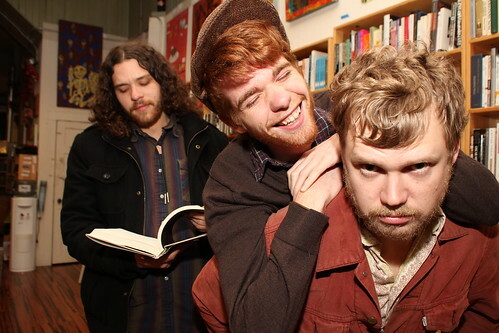 Sean Sullivan (left), Kevin Sullivan (center), and "Mr. Andrew" Skewes-cox, members of the band, Rin Tin Tiger, post for photo in the Alley Cat bookstore, Feb. 9, 2012. The band was there for a indie-band music event. Photo by Hang Cheng. Through their own initiative, the organic, alternative-folk tunes of Rin Tin Tiger have reached listeners across the world. The band itself, however, has managed to keep its roots firmly planted in the Bay Area. The dual act of the Sullivan brothers, Kevin, on guitar and vocals, and Sean, on bass and vocals, joined forces with drummer Andrew Skewes-Cox in 2010 and have been playing as Rin Tin Tiger ever since, sticking to stripped-down sounds and an indie approach to the music business. Students may have caught Rin Tin Tiger performing on campus last semester. Sean, a 2011 graduate of the SF State creative writing program, said that the band enjoys sticking close by. They have close ties to The Depot, and with fellow musicians here like broadcast and electronic communications major Derek Schultz of the band Owl Paws. But Rin Tin Tiger isn’t just bringing that energy to local stages. While the band guarantees that their best shows take place at Bottom of the Hill, they said they’ve been the most successful in getting their music out through good old-fashioned busking. Through playing on the streets, usually at Powell and Market streets during the spring and summer months, the band has gained a wider audience than Internet presence alone ever could have achieved. While the band knows that Facebook and iTunes are helpful tools for indie artists like themselves, they also know that nothing beats persistence and interaction in the real world. “(Sean is) great at pestering people and being shameless,” said Kevin, in reference to how the band landed a Noise Pop gig last year opening for Max Bemis. Some of their best opportunities have come through performing at Bottom of the Hill, where they have formed a solid relationship with Ramona Downey, who is in charge of booking the talent for the venue. It’s Sean’s initiative that gets them on those bills, which tend to draw impressive crowds who stick around and stay enthusiastic for all the acts. This persistence has paid off. With 2011 Noise Pop, 2010 Left Coast Live, an EP and several Bay Area appearances under their belt, Rin Tin Tiger is getting ready to release a brand new, eight song recording. Recently completed at the Tiny Telephone studio, the new release was recorded completely live to two-inch tape, without the use of editing software. This reflects the band’s personal preference for live, raw, classic albums. The band has the release date for their new recording set tentatively for this summer. Fans can visit their Kickstarter page to help fund the release, get updates on the recording process and pre-order the new recording. “We’re kind of inviting fans to come along with us on the journey of recording through these exclusive updates on the Kickstarter,” said Sean. Catch their next show Feb. 18 at Art Boutiki in San Jose.